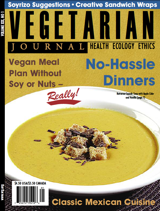 简　介：Covers various aspects of vegetarianism and veganism, including health, recipes, ethics, ecology, world hunger, and animal rights. Contains information about restaurants, new products carried by supermarkets, and results of the latest medical research. Aims to present nutritional information based on current scientific literature in an easy and practical fashion.